The deterioration of low voltage circuit breaker is normal and this process begins as soon as the circuit breaker is installed. If deterioration is not checked, it can cause failures and malfunctions. The purpose of an electrical preventive maintenance and testing program should be to recognize these factors and provide means for correcting them. A good organized maintenance program can minimize accidents, reduce unplanned shutdowns and lenghten the mean time between failures of electrical equipment. Benefits of good electrical equipment maintenance can be reduced cost of process shutdown (caused by circuit breaker failure), reduced cost of repairs, reduced downtime of equipment, improved safety of personnel and property. Low-voltage circuit breakers operating at 600 volts alternating current and below should be inspected and maintained very 1 to 3 years, depending on their service and operating conditions. High humidity and high ambient temperature. A breaker should be inspected and maintained if necessary whenever it has interrupted current at or near its rated capacity. An initial check of the breaker should be made in the TEST position prior to withdrawing it from to enclo­sure. Insulating parts, including bushings, should be wiped clean of dust and smoke. 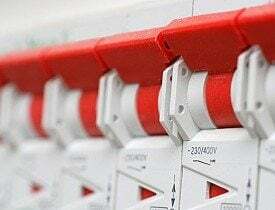 The alignment and condition of the movable and stationary contacts should be checked and adjusted ac­cording to the manufacturer’s instruction book. Check arc chutes and replaces any damaged parts. Inspect breaker operating mechanism for loose hardware and missing or broken cotter pins, etc. Examine cam, latch, and roller surfaces for damage or wear. Clean and relubricate operating mechanism with a light machine oil (SAE-20 or 30) for pins and bearings and with a nonhardening grease for the wearing surfaces of cams, rollers, etc. Set breaker operating mechanism adjustments as described in the manufacturer’s instruction book. If these adjustments cannot be made within the specified tolerances, it may indicate excessive wear and the need for a complete overhaul. Replace contacts if badly worn or burned and check control device for freedom of operation. Inspect wiring connections for tightness. Check after servicing circuit breaker to verify the contacts move to the fully opened and fully closed positions, that there is an absence of friction or binding, and that electrical operation is functional. Thank you very much, This site is my adviser.